INTRODUCING ONE OF THE BIGGEST JACKPOTS IN RACING FOR ONLY A SMALL OUTLAY!! Yes, the name ‘Four From The Gods’ might have you laughing or sounding a bit corny – but believe us this service is far from it! Make no mistake this is one of the best PRO BETS going – those that make their living betting on horses – LOVE IT, AND THE BOOKMAKERS HATE IT! This ‘LUCKY 15’ approach really will give you steady winners, but above-all also give you shout of that monster pay-out each week! Four From the GODS is the original LUCKY 15 pro-betting service that will keep you ticking over with winners, but – more importantly – also give you a weekly chance of a lottery-style payout! 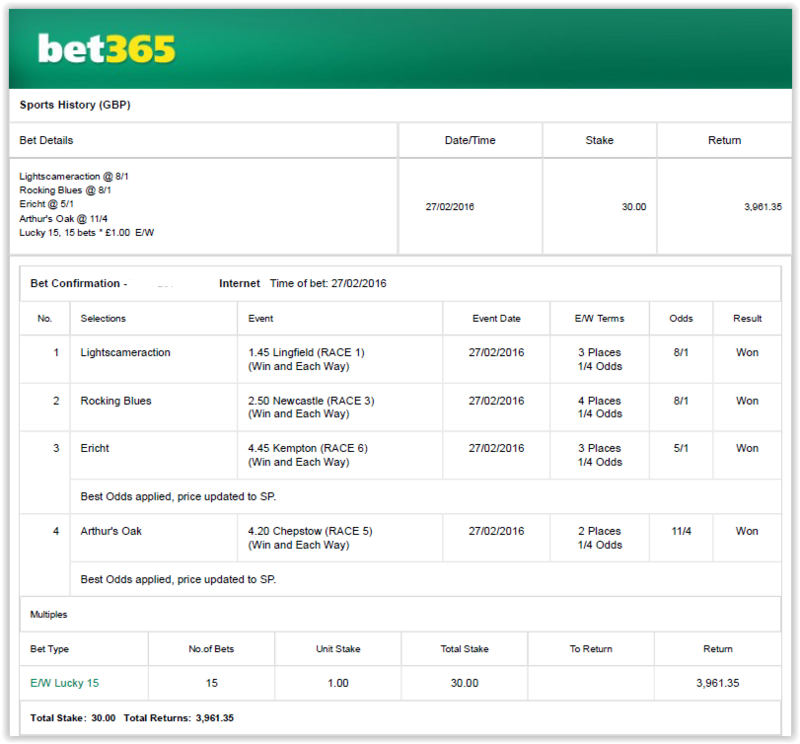 WE’VE AT TP HAVE BEEN DOING THEM FOR YEARS-HERE’S ONE MONSTER PAYOUT FOR JUST £1 Stake! Just 1 winner (from the 4 selections) will most days give you a profit with the odds we are talking about – 2 placed horses the same – but when everything falls into place and these pros fire in 4 winners on the day it’s time to book that holiday or go and treat yourself as these payouts are BIG! So, let’s cut to the chase – what is ‘FOUR FROM THE GODS’ , how does it work and why should you become involved? The clear brief behind this offering many years ago was to create a service which would allow in every type of punter……….. be it Big or Small! Be part of a professional service at a very affordable price? Backs horses at decent prices? With the selection process supplied by professional gamblers? Or to look at it another way, to allow punters the best chance possible of backing winners, making profits but also chasing regular MONSTER PAYOUTS. Four From the GODS allows this to happen, but also in a potentially ‘mind-blowing’ way for the Bookmakers by adopting a logical approach to winning BIG! 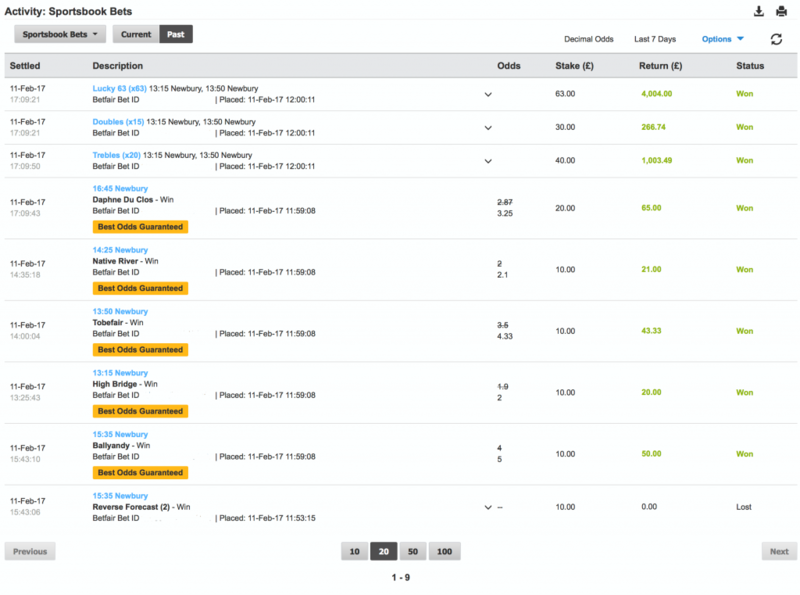 Four From the GODS is played every Thursday to Saturday – which are mostly the better racing days and consists of FOUR single bets from a carefully selected group from the experienced TIPSTER PLATFORMS Team – YOU’VE SEEN THEIR RESULTS EARLIER! Although we are obviously chasing the Lucky15 jackpot each day the main objective is to make long term profit from the singles – that will be the bread and butter, but once one of the Lucky15 lands – it’s party-time – tell your boss to do one, or maybe have a well-deserved holiday – it’s up to you! Your winnings are topped up in dramatic fashion!! We’ve created the perfect tipping service allowing steady growth of profits with the chance to land the Knockout blow on the bookies – The concept is simple, but the tips are from SOME OFF the best pro bettors and judges in the country so with confidence…………This is a FANTASTIC CHANCE and your best way of winning big on the market today!! Here at Tipster Platform we are thrilled to have this unique offering that allows everyone to get involved – and in the process experience the thrills and spills of our wonderful sport. Amazing how all add up to a Monstor Jackpot! We play Four From the GODS every Thursday to Saturday or every day of the Major Festivals. Members decide when they want to play they are always in control – free text’s are sent when there are betting day and only if you reply back with the keyword ‘GOD’ will you then be sent the four selections.